Kathleen reported on the progress made through Scottish Government £2M support package for Community Choices in 2016/17. Self-evaluations of the projects supported through the funds disbursed in 2016/17 are currently being analysed. Discussions are taking place between the Scottish Government and COSLA to explore how to take forward the target of having at least 1% of council budgets subject to community choices. There is commitment in SG to continue to support PB to the same level in 2017/18, subject to Ministerial approval. Discussion points focused on digital, equalities and following the public pound. It was agreed that a sub group should be formed to examine the above issues in more depth. It was agreed that PB Scotland should offer a learning event focused specifically on equalities. Is there a need for guidance on PB and following the public pound? Angela gave a summary update on the findings of the evaluation work so far. An interim report is imminent. The evaluation work is expected to continue over 2017/18. GCU is working in 20 local authority areas and is developing 6 in depth case studies. They are using a combination of focus group discussions, observation, and interviews with community organisations and activists, applicants, grant recipients, unsuccessful applicants, elected members and officials. 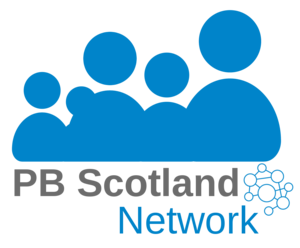 The research is focusing on the impact on services, communities and democracy, and on equalities and diversity of participation, all in the context of early stage development given that PB is a relatively new and rapidly emerging phenomenon in Scotland with new ideas and new language. Different methods and formats are being used, with varied responses. Potential for action research – what could be different in the small grants model? Testing mainstream. It was suggested that the PB Scotland nominate a person to sit on the PB working group, or that representation is rotated. It was agreed that terms of reference for each group need to be agreed.